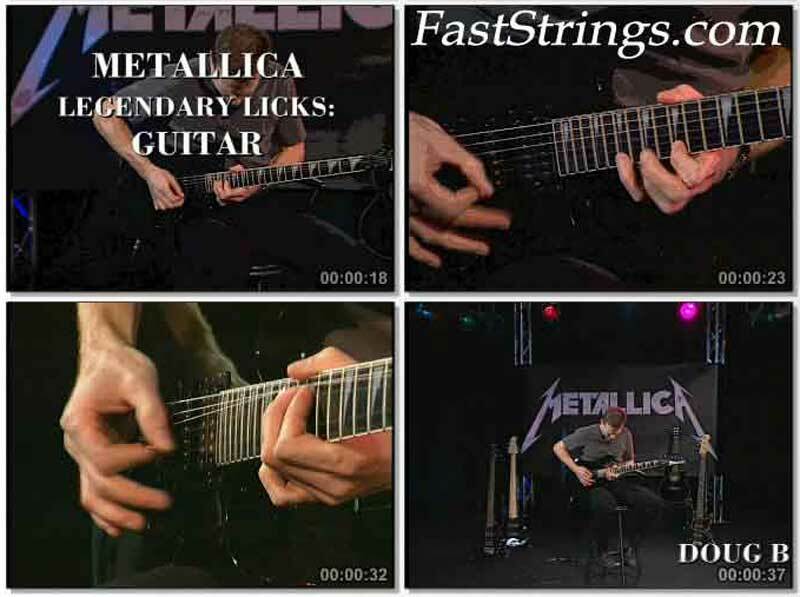 Metallica Legendary Guitar Licks 1988-1997 DVD download. This follow-up to the “Guitar Legendary Licks 1983-1988” DVD contains the band’s music from the late ’80s and early ’90s. Each riff and solo is played up to speed, then broken down note by note, then played at a slow tempo. This DVD is absolutely excellent. It’s like having your own private guitar teacher teaching you a host of Metallica riffs from 1988-1997 (riffs, licks, fills, & solos) plus tuning (standard, 1/2 step down, and 1 full step down) and Metallica guitar techniques including guitar & amp settings. Each song’s riffs are done at normal speed, then slowly explained and shown note-by-note, and then played again at slower than normal speed – all with a split view of the fretboard and the string picking at the bridge so that you can see exactly what is happening at all times. The DVD also has a very good menu. You can replay any section over and over again – which is very easy with a DVD player – until you get it, and then move on. Although it has a companion music book (with CD)1988-1996 Metallica, a DVD picture is worth a thousand words in showing you HOW something is done. The disc is proposed to tune the guitar on the rhythm of Metallica, then reviewed in detail how to play songs listed above. The guy shows how to do it quickly, then slowly. At the end demonstrating several techniques of guitar playing, which are used in trash metal. Hello! could post the guitar book: Play Guitar With… The Best Of Metallica (Tab) Book/2Cd. thank you. I’ll give my comments after I download. Wow – all these are some of my dream videos !!!! This site ROCKS – Big Time !! !